OnePlus 3 is a device which puts even the premium manufacturers to shame, but not when it comes to software. OnePlus 3 updated to OxygenOS 3.2.4, and despite fixing the previous issues, the software update seems to bring more issues. Owners of OnePlus 3 have been complaining about RAM mismanagement, poor battery performance, and other issues since day one. However, OnePlus has been quick to respond and send out a hotfix every time the issue arises. 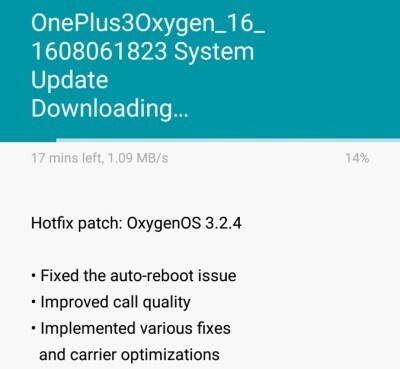 The latest 26MB package will have your OnePlus 3 updated to OxygenOS 3.2.4 fixing the following issues. However, users are already reporting issues right after the latest OnePlus 3 update was installed. The primary issue after OnePlus 3 updated to OxygenOS 3.2.4 is with Android Pay, while a small number of users have reported a major cellular issue. Users have complained that the LTE, 4G, 3G, and 2G cellular quality has been degraded with the latest update. Although OnePlus has not yet sent out an official response to the complaints, another hotfix for these issues should be out soon. Has your OnePlus 3 updated to OxygenOS 3.2.4 already? Are you among the victims who are suffering from the issues mentioned above? Let know your opinion in the comments section down below.